Let's face it. Much like anything these days, restaurants are changing with the times. As much as the basic restaurant can do the job in terms of offering up good eats, it is lacking in all other areas. For example, why must we have the latest technology such as the iPhone 4 or a nicer car when we can get by with a classic Motorola brick-of-a-phone and a Pinto? Simple, because we have wants that are not necessarily needs. That has been the case for quite awhile since the dawn of consumerism. Hence, I find it quite troubling that people merely write off things that are deemed frivolous for nothing more than being "trendy" or "mod ern". Take Bao Bei for instance. Yes, it is not your typical Chinese restaurant; but it is not trying to be so. With that in mind, there are some decent eats there that go along with their awesome drinks. Even Terracotta has some okay dishes as well despite some flops. Hey, no restaurant can be perfect you know. There is a lot that goes into operating a restaurant! And that gets into the topic of exactly what is the target clientele of a particular establishment. The bottom line of any business is to make money. Plain and simple. So they will cater to its core customers. T ake East Side Mario's for instance. Their "Italian" food is dumbed down to be a safe place for those who are not as adventurous. In fact, they have introduced some more classic dishes in the past to no avail. Thus, they end up keeping the items which sell and ditching the ones that do not. 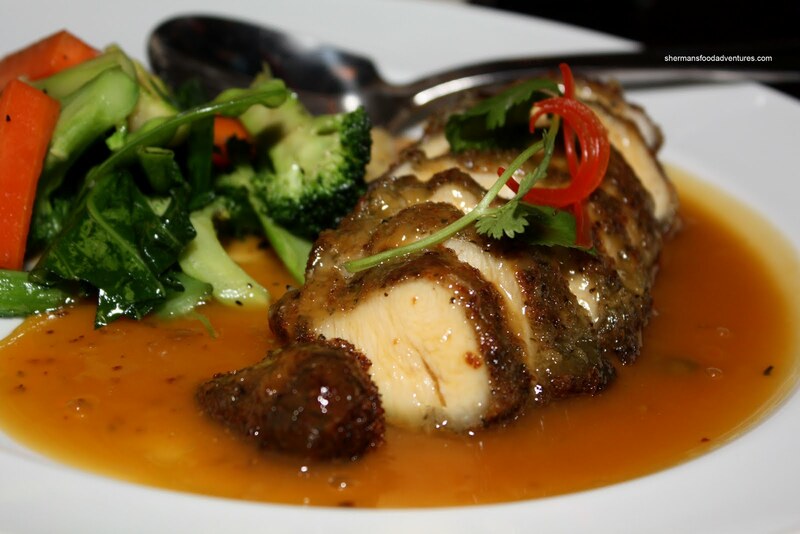 With all this in mind, restaurants in Yaletown can never be judged solely on their food. C'mon, let's get real here. Yaletown is trendy. Yaletown is expensive. Yaletown is about style. My point? If you don't like this, then don't eat there. Plenty of other places in the GVRD. Now, the food still needs to be at the very least decent since a restaurant is a place where one eats... By merely providing style without edible food is not good for the longevity of any restaurant (Society is an example). 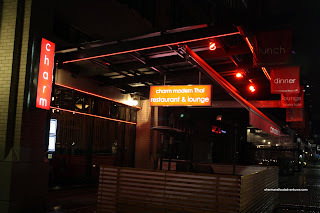 I'll be honest though, for the reasons provided, I have hesitated to try Charm since Thai food is expensive enough without being located in Yaletown. However, I got invited to give Charm a try and I figured why not? So I ended up going on a regular Tuesday night dinner service (with them knowing I was there of course). And yes, here is my usual disclaimer... Sure they invited me; but once again, a restaurant c an only be as good as it can be and can be only as bad as it can be as well. And of course, you know I'm gonna give you my honest opinion. 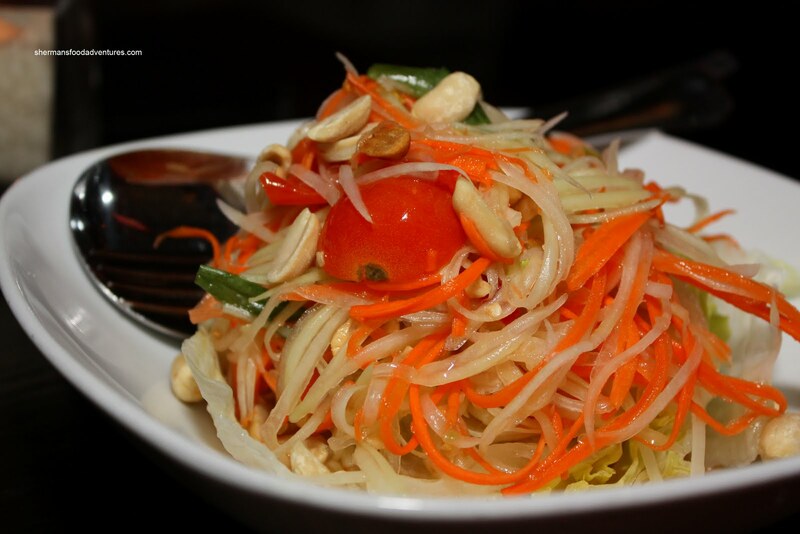 We started off the meal with the Green Papaya Salad. The colours were vibrant and the ingredients exhibited a very fresh crunch. Unlike some other versions of this salad, the flavours were bold. Lots of fish sauce and a bit of spice, it was amazingly balanced. Viv thought that there was a good mix of salty, sweet, tart and spice. The roa sted peanuts added a nice aroma and extra crunch to the dish. Now for one of their signature items - The Duck Sticks. As advertised, these were awesome. 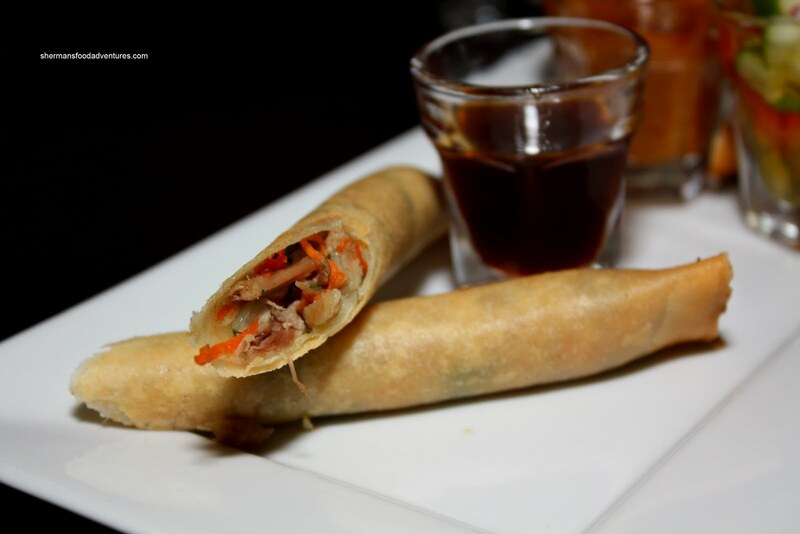 Of course anything put into a spring roll is not exactly rocket science. However, these spring rolls had a pronounced duck flavour. That put it over the top because being crunchy isn't uncommon for a spring roll; yet having a pleasing duck taste makes it special. 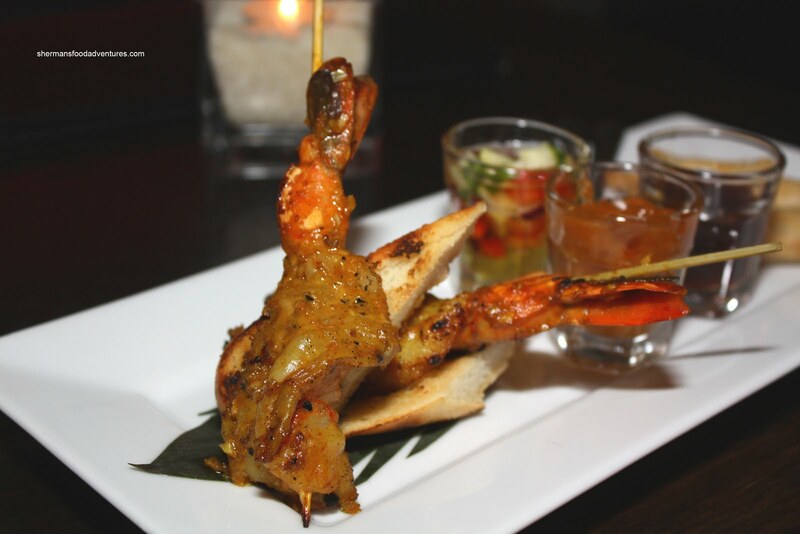 Presented on the same plate was the Tiger Prawn Satay. These were barely cooked and I mean barely. It appeared they were marinated in a peanut/curry satay sauce. They were s erved with Thai-style garlic toast, Thai peanut sauce and cucumber chutney. The prawns were so tasty, there was really no need for the peanut sauce. Somewhat of a strange combination, the cucumber chutney atop the garlic toast worked. However, we would've preferred more tartness from the chutney. 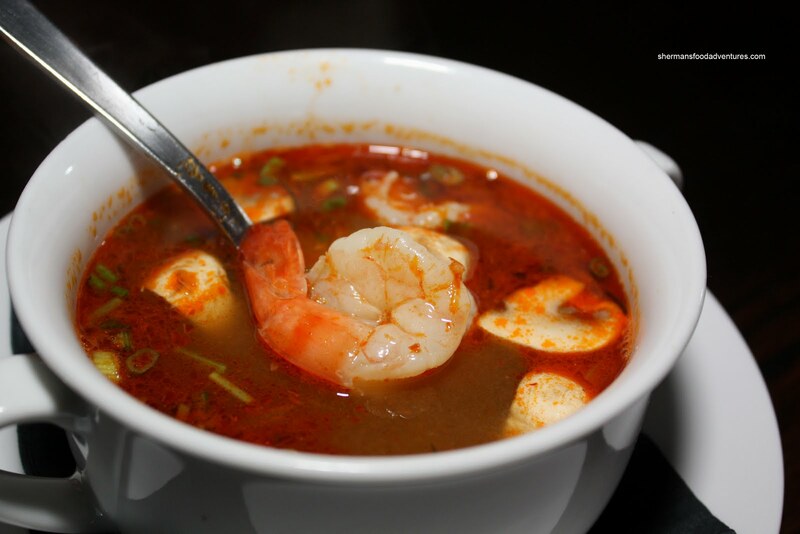 Next up, we had the Tom Yum Goong with perfectly cooked prawns. The broth was very flavourful with big hits of lemongrass, fish sauce, cilantro and galangal. Despite some bold flavours including some spice, it was well-balanced. For our first m ain, the Pineapple Braised Short Ribs, we found the red curry to be quite good. A good balance of coconut milk, spice and sweetness from the pineapple. Personally, I would've liked it spicier; but again, restaurants usually cater to the masses. Curiously, the short ribs were a bit dry; despite being tender. Our next dish was something that we didn't prefer. I have to give them props for something as creative as Green Tea Chicken; but we found the green tea coating very overpowering. There wasn't anything inherently wrong with the orange and ginger glaze, there was just too much of it. The side of vegg ies were prepared perfectly being crunchy and not overseasoned. 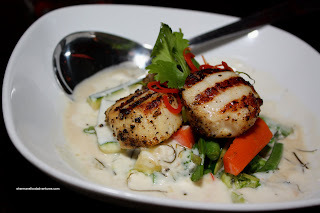 Our last entree was the Coconut Cream Scallops. The scallops were nicely grilled and barely cooked inside exhibiting a slight smoky aroma. Curiously, 2 of the scallops had a bit of chewiness around the edges. Possibly a bit uneven flame? The coconut cream sauce and veggies underneath let the scallops do all the talking. No need to overwhelm such a delicate and naturally sweet item. 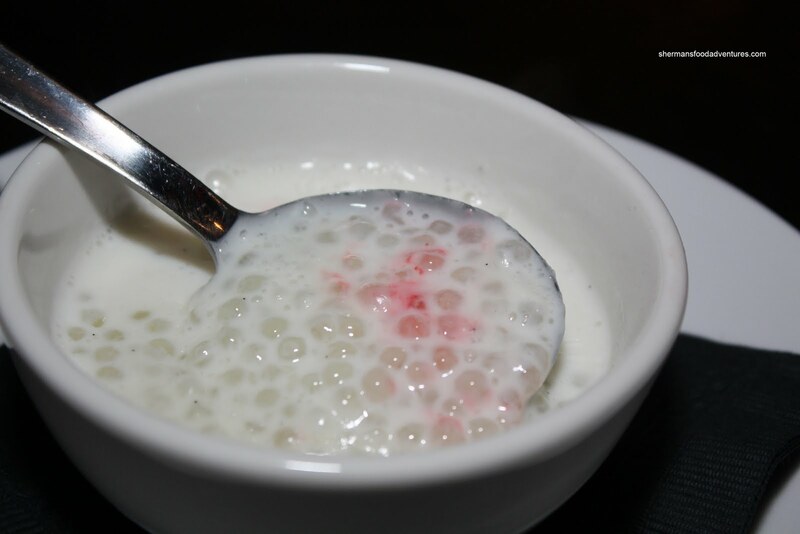 As for our desserts, we started with a Vanilla Bean Tapioca which was not sweet at all which is a good thing. We could see the vanilla bean; but couldn't taste much of it. 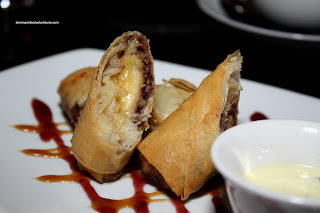 Lastly, we had the Deep Fried Banana with vanilla sauce. Once again, anything stuffed into a spring roll will have a good chance at succeeding. This was not different. The banana was very ripe; hence it tasted good on its own and we could barely detect the chocolate and coconut. Although not mind-blowing, most of the food was pretty good. 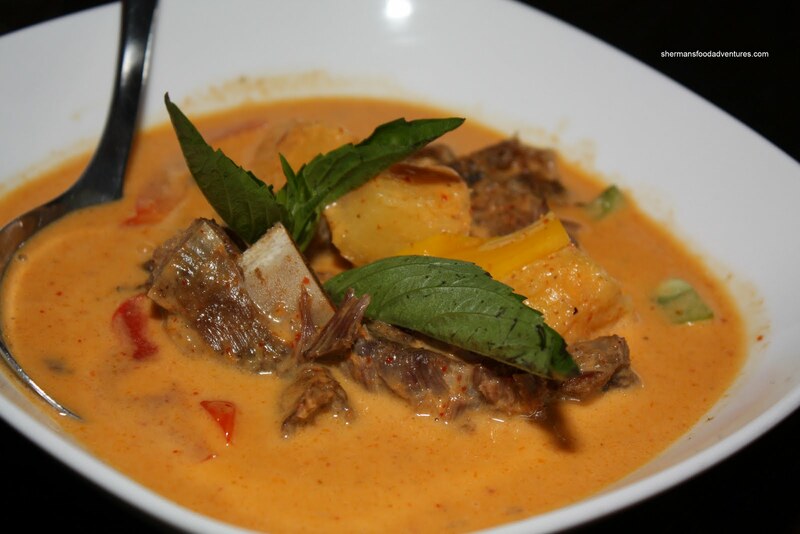 As much as it is advertised to be modern Thai, most of the items on the menu are quite traditional cooked by actual Thai chefs. As for some of their more adventurous creations, I guess it comes down to personal preference. To be honest, it was better than I expected. 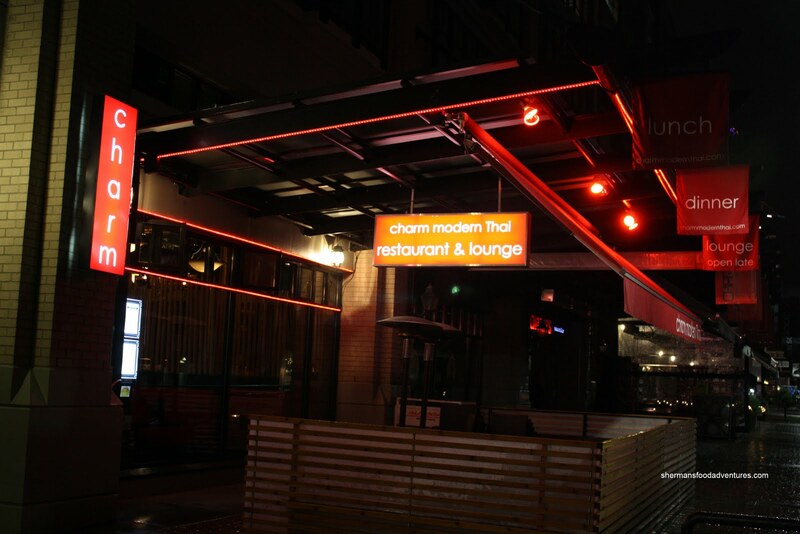 Of course, we need to take into account that Charm is one of many restaurants in Yaletown that share the same model. 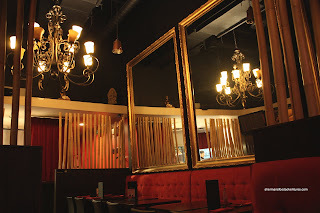 That is, to fit into the Yaletown scene with progressive food and a little pizazz. Hey, I get it, I really do. I lived in Yaletown for 6 years after all. Of course, if you wanted Thai food for cheaper, it definitely can be found elsewhere. That is not rocket science. 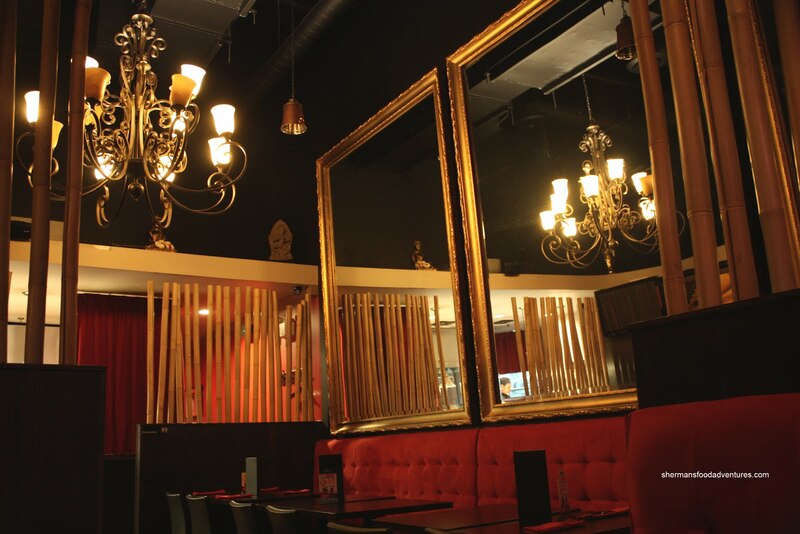 But if we take Charm for what it is, their target clientele and where it is located, it is a good place for drinks, appies and certain dishes. We went here a long time ago (maybe 8 months ago?) -- anyways, the food wasn't that bad. It was just not compelling enough for us to go back. But yes, a restaurant stays in business by giving customers what they want and what they're willing to pay for. It's really no use for a restaurant to keep serving an "authentic" dish if nobody wants it or orders it. It's banging your head against a wall. E.g. if a ketsup-laced, sweet, pad thai is what customers want, it's what they want. What's the point of serving them a funky, fish-sauce-laced version if they're just going to turn their noses up and return the darn dish? It really is not the restaurants' "fault" -- they're not trying to "rip customers off" by serving an "inauthentic" dish. Like heroes and politicians, we the dining public get the restaurants we deserve. JS, I think we're on the same page here. I would return to Charm. It is what it is and I didn't mind most of the food. I prefer not to compare it to other Thai restaurants because you cannot. It's like comparing Bao Bei to Congee Noodle House. Apples to oranges. JS, I agree and disagree at the same time with your line of thought. If it is something "time consuming" to prepare, well, yes. For example, Montana's Cookhouse. Is it BBQ? No! But their ribs are darn tasty, regardless if it is "authentic" or not! However, for pad thai, something that has to be made to order and switching from tamarind and fish sauce to catsup is part of the process and minor details, why not give the option? Sala Thai has both in the menu!